Mac became interested in magic as a kid because both of his grandfathers (Elwood Huffman and Pax King) were keen amateur magicians. Elwood would perform a trick for Mac, and when asked how he did it, Elwood would point to his shelf of magic books and say, “It’s in one of those.” Mac would then have to sort through all the books looking for how to do that particular trick. A few years later it finally occurred to Mac that this was merely Elwood’s little scam to get Mac to read more books! As a kid Mac would do a show for his family and friends just about any time he could, but his first paid show was for one of the Herbert kid’s birthday party when Mac was 10. He got a whopping five bucks cash (plus cake). The first show he was paid by check was for his Grandfather Elwood’s Kiwanis Club in Greenville, Kentucky. Mac got 35 dollars for that show (but no cake). Mac’s only non-magic job was as the chef for the only (at that time) 4 star restaurant in Louisville, Kentucky. What Do You Do With a Degree in Anthropology Anyway? Mac attended Macalester College in Saint Paul, Minnesota on a National Merit Scholarship. He graduated with Highest Honors in 1981 with a double major (Anthropology and Magic). During his summer vacations from college Mac performed in a two-person magic act with fellow Kentucky magician Lance Burton at a western-themed park in Cumberland Falls, Kentucky doing three magic shows a day, seven days a week. This proved to be a great training ground for these two colleagues to develop their unique individual approaches to magic. After graduating college Mac took his show on the road, eventually headlining all the major comedy clubs in America. Mac met his wife, Jennifer Sils, at one of his shows. She was a volunteer from the audience! They were married in Louisville, Kentucky in 1985. After moving to Los Angeles in 1987 Mac’s amazing visual style of magic, and offbeat (but decidedly friendly) approach to comedy eventually caught the eye of the producers of all the stand-up comedy TV shows like An Evening at the IMPROV and Comic Strip Live that were so popular in the late 80’s. Because of the visual nature of Mac’s act he discovered that he wasn’t limited to American audiences. He’s performed both live and on television in China, Spain, Japan, Australia, Denmark, Sweden, England, Argentina, Holland, Finland, Canada, Chile, and Portugal. Because Mac’s act is not only original and extremely funny, but also very clean (he doesn’t even say “damn” in his show), he found that corporations around the country were vying for his services. In addition to simply performing his show as their after-dinner entertainment, Mac has had great success as a congenial host for their various meetings. In the last few years, magic shows on television have become more popular than ever, and Mac has been there from the beginning. That beginning was, of course, with David Copperfield. Mac had developed a magic trick that just wasn’t right for his own show, but David thought enough of it to pay Mac for it and put in his live show and then on his television special later that year. The next year, the same thing happened with Penn and Teller. Mac was beginning to make a name for himself as a creative force in the magic world. 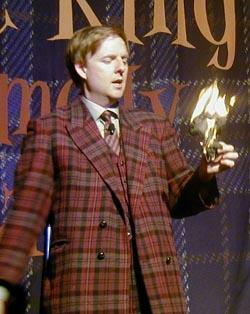 All that attention garnered Mac a showcase for the producers of NBC-TV’s The Worlds Greatest Magic shows. His unique hilarious tricks, including his ability to make his head cave in, landed him a spot on the first of these highly rated annual specials. After seeing him on that show, all of the people involved just had to have him in their next big NBC magic show, Houdini: Unlocking His Secrets where Mac performed his absurdly comical rendition of Houdini’s Thumb Tie Trick. The segments Mac devised the following year for The World’s Greatest Magic II were so popular that The Mac King School of Magic became a regular fixture on all of The World’s Greatest Magic shows. Mac is the only performer to appear on all five of these exceptionally well-received shows. His success on those programs landed him a spot on another NBC special, The World’s Wildest Magic. Which, in turn, lead to him being featured on Penn and Teller’s Sin City Spectacular. Because all of those NBC TV shows were taped at Caesars Palace in Las Vegas, Mac began to get the attention of some of the bookers of Casino showrooms in that fabulous city. He and Jennifer moved from Los Angeles to Las Vegas in early 1997. Mac has appeared in Spellbound at Harrah’s, The Great Radio City Music Hall Spectacular at The Flamingo Hilton, at The Desert Inn with Comedian Rita Rudner, and in Splash! at the Riviera. Before moving to Las Vegas, Mac was working on the road an average of 220 days a year. Given the hilarious nature of Mac’s act, and the broad spectrum of folks it appeals to, it was inevitable that a casino would come calling with a full-time offer. Mac began a two-year run with his own one-man show (The Mac King Comedy Magic Show) in Las Vegas at the Harrah's Casino and Hotel on Jan 11th, 2000. That initial run has now been extended through 2015! Mac spends most of his increased spare time developing new material for this show. His latest ridiculously amusing creation, The Cloak of Invisibility, has to be seen to be believed. At the end of 1999 Mac made his first appearance on the new syndicated Donny and Marie Show, where he performed his Amazing Goldfish Trick. Using a small piece of a Fig Newton as bait, Mac caught live goldfish on a fishing line cast out over the heads of the audience. His October appearance was so successful that it made their year-end highlight show of The Best of 1999. Mac made 4 appearances on their show before it was cancelled (not Mac’s fault). And a couple of months ago his house was featured on Home and Garden Television. After his success in daytime and prime-time TV, it was inevitable that late-night TV would come a-callin’. Mac’s appearance on The Late Show with David Letterman really rocked. Obviously, you should keep your eyes peeled for reruns of all of Mac's TV appearances. A couple of years ago Mac and his cousin Bill King (who is a wildly successful commercial artist in Chicago) got the crazy idea to start a weekly syndicated comic strip called Mac King’s Magic in a Minute. This Sunday color feature presents a handsomely drawn Mac King teaching a simple magic trick to his monkey sidekick, Lewis. This comic strip is syndicated by Universal Press Syndicate/U-click and is featured in Sunday papers in the US around the world. The popularity of the strip and the hilarious Bill King artwork have led to many offshoots. KFC and Applebee’s restaurants have featured Mac King’s Magic in a Minute on it’s kid’s meals, KOL (the kid’s version of America on Line) has presented numerous special Mac King video magic teaching segments, and BoysLife.org, the online division of Boy’s Life (the scouting magazine) now features tons of Mac King videos, tricks and stories. Barnes and Noble continues to offer Mac King’s Lunchbox-O-Magic, Mac King’s Book-O-Magic and Mac King's Magic In A Minute Suitcase-O-Magic, boxed kits at retail outlets everywhere and online. Mac’s hilarious how-to book, Tricks With Your Head just entered it’s 9th printing with Random House. Just released is a book of magic to do around the campfire, Campfire Magic, produced by specialty book publisher Black Dog and Leventhal. With all this stuff out there, Mac has probably started more beginners on the road to magic as a hobby than anyone else, ever. Mac is the spokesperson for Optimist International’s JOOI of Reading program. “The skills you develop when you’re learning to read really do make a huge difference in how you do in school and therefore how you do in life,” he says. Mac started volunteering to read in public schools years ago and, after seeing how many school libraries were inadequate and how many second- and third-graders were unable to read, he was inspired to promote children’s literacy. His involvement with the JOOI of Reading program is an extension of that work. He has an annual book drive in Las Vegas which generates 1000s of books for needy school libraries. According to his wife and daughter, Mac is a fine husband, a great dad, and all around swell fellow. Died: Once in Denver, Colorado, but that was a long time ago.